Chorasing is a work in progress initiated during a Performance as Process Residency at Delfina Foundation, London. Chorusing is a new scoring system for collective voice and movement that does not require any prior knowledge in order to be performed. Research for this work draws on traditions of polyphonic song, Hispanic transcription and the history of the ancient Greek chorus looking at the relationship of voice, action and materiality as well as theories of a universal tongue, proposed in radical Aristolelianism, through to Dante and Umberto Eco. Chorasing is a scoring system based on subjective interpretation of gestures and directionalities and is rooted in improvisation allowing small or large groups of people to sing their own song as an individual while simultaneously singing together as a group. To date this work has included a one-day symposium and performance experiment exploring the relationship of voice to transcription – of utterance and the written score. Contributors to the symposium included specialists in a variety of fields, including Elsa De Luca, Palaeographer, (University of Bristol), and Jerome Lewis, Anthropologist, (University College London). 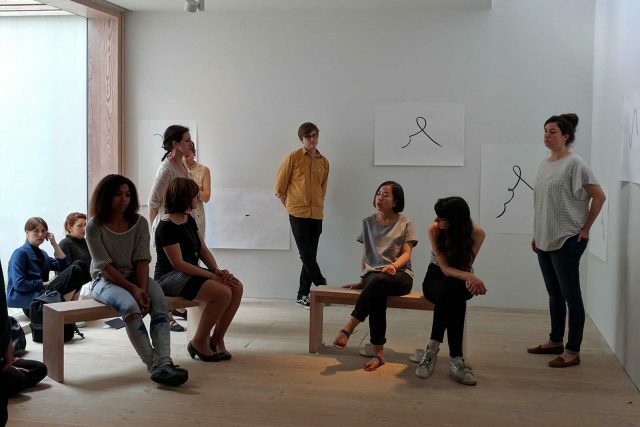 The performance experiment was performed at Delfina Foundation by choral singers and members of the public using a pilot of the new score for collective voice.